Last week when CMS released the public data set, the Medicare Provider Utilization and Payment Data: Physician and Other Supplier Public Use File (PUPD for short), most of the articles primarily focused on the top ten physicians with the highest charges. The focus was on sensationalism and in general missed the main point of this data. Although these articles may have mentioned some other points, they primarily focused on the "top billers". We, at Stratasan, have downloaded the data and analyzed it a little differently. Below are the top ten Healthcare Common Procedure Coding System (HCPCS) codes in volume in the file. Physicians who saw one million visits for an office or outpatient visit with an established received on average $54.92 for that visit. These top ten codes represent 4.3% of the total codes in the database. 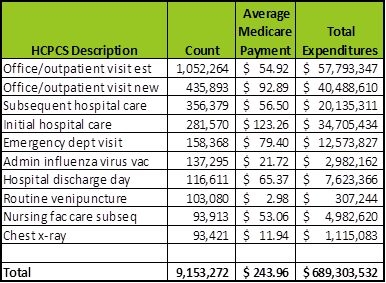 The physicians received on average $244 per visit. We are analyzing the data from a market perspective for customers. We're analyzing the top physician office visit codes for physicians in their service area giving them insight into what is being seen in their community's physician's offices. If your organization interested in reports based on this data, contact us at sales@stratasan.com. Quiz: How Strong is your Data QA Process?